We are committed to serving the whole child in their spiritual, physical, social and cognitive development, and to fostering strong relationships among our families, church, school and community. 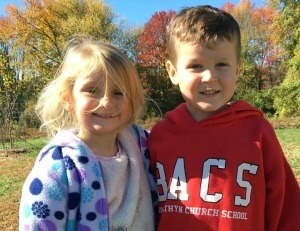 The Bryn Athyn Church Preschool provides an excellent environment and education for your child to grow and learn. Our goal is to nurture a zest for living that is a natural part of early childhood and to provide an atmosphere which allows them to learn about themselves, each other, the world and a loving God. Our Two Year Old Program provides a fun first school experience through play and teacher-run activities. Learning about the Lord and His big world will happen through exploration outdoors and in, and through worship songs and finger plays. Your two-year old will have an opportunity to play with other children while learning a variety of fun songs. If you like your two-year old to use paint on an easel, or finger paint, or glue, or sprinkle glitter….. here’s your chance to do it! Two-year old preschoolers are enrolled for one or two days (Monday and/or Friday) for 2 hours each time. Children do not need to be potty-trained. The Three Year Old Program continues our commitment to serving the whole child through play and teacher-directed activities and projects. Learning how to be in a group setting allows the 3-4 year old to successfully navigate new social interactions and getting along with others. Through independent exploration, structured activities, and hands-on learning, children develop a variety of skills and knowledge. Our Three Year old Program runs Tuesday, Wednesday and Thursday from 8:00 or 9:00 am until noon. They are also invited to enroll in our Wonder Garden Program from 12:00-3:00. See the description below. Children must be reliably potty-trained. The Four Year Old Program starts where we left off with the three-year olds; social and emotional development and ads a level of pre-reading and pre-math skills as we look towards Kindergarten. Prekindergarten is a time when children are making connections between what they know and what they are learning. As they leave the world of preschool and head towards kindergarten, children are learning to participate in routines, demonstrate ability to make decisions, and plan ahead. Our curriculum is designed to prepare the four and five year old children for the next stage of their education, while giving them a place to feel comfortable and safe to explore relationships and their interests. Our Four Year Old Program runs for three, four, or five mornings (you choose) from 8:00 or 9:00 am until noon. Our extended afternoon program, Wonder Garden is also available from 12:00 to 3:00 pm. See the description below. MUSIC ENRICHMENT: Miss Lori, a veteran music teacher, comes in once a week to teach us music. Not only are the children exposed to a variety of clever songs and games, she also has a wide variety of instruments for the children to try. The class runs once a week for 30 minutes. SPANISH: The children have a 20-30 minute Spanish class once a week. Through a variety of mediums we teach the child colors and numbers and animals and body parts and lots of other words. And at Christmas-time, make sure to ask them to sing you Feliz Navidad! They learn that one quite well! Wonder Garden is an afternoon program for Preschoolers and Kindergartners. The children bring their own lunch to eat in the classroom. We then have a nice “down” time of 20-30 minutes. The children have their own mats (that we provide) to lie on so that they can read or listen to a book. Sometimes they do puzzles or play quietly at their mat. This is a good time to recharge their battery for the rest of the afternoon when we go outside, create arts and crafts projects, or play. We take school safety very seriously for your preschooler. Our building is locked and employees must have swipe cards to enter. Visitors are welcome, and we encourage parents to come in! We have a name tag and sign in system that is easy for parents to feel welcome AND know that their child is safe. We also have a full-time school nurse who we can call on anytime. Please come in for a a tour of our school! You will find our classrooms bright and welcoming and a big outdoor play area.